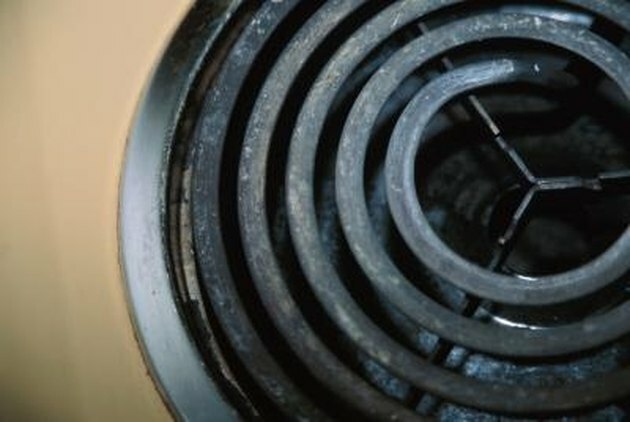 The drip pans below electric burners can become encrusted with burnt-on food debris. Burners on most electric stoves are removable for cleaning purposes. Food-covered drip pans can be cleaned in place or removed for soaking, once the electric burner is out of the way. The burners can be quickly reinstalled after the drip pans and surrounding area are washed. Restore the look of an electric range with a quick disassembly and cleaning. Spills are burned onto drip pans by the electric-burner heat. Turn off all the burners on the stove. Wait for them to cool completely. Look for the socket that the electric burner plugs into. Grip the outer edge of the burner coil as far from the socket as possible. Lift the coil up an inch above the edge of the drip pan. Pull gently away from the socket. Rock the coil gently back and forth until it releases. Remove the tripod stand below the burner, if there is one present. Grip the edge of the drip pan farthest from the socket to lift it out for cleaning.